We are moving along with the shore kitchen renovation (cabinets are arriving later this week!) and its time to start the countertop selection. I want marble (or something like it). I've known this from the start despite lots of protest from contractor, cabinet guy and anyone else who feels the need to chime in. I get it, marble isn't going to look as perfect as granite over time. That is okay. I like old. I like patina. I'm not going to flip if it doesn't look perfect. ENOUGH WITH THE WARNINGS! Granite may be the more durable stone but I just don't dig it. So no amount of scare tactics will make me think otherwise. (Not to mention I've had granite and its not stainproof either) I've never seen a granite that looks like marble no matter how much people say it does. Maybe its out there and I've never come across it? Or maybe I have a very low tolerance for faux in this particular situation? So off we went last week to price out some options - marble and white quartz specifically. The prices, quality and service were all over the map but consistently bad. Quartz seeme to be about 60% more than marble so I think that option has been ruled out entirely. Oh joy! We'll be back out there this weekend pricing countertops. Wish us luck. I LOVE marble!! Ever been to a bar, especially an old bar? They ALL have marble and it has been there many, many years, and it looks GREAT! Have you ever seen the kitchens and restaurant tables in Paris, they all have marble, and they look GREAT! Have you ever been inside historical homes in New Orleans, so very many of them have marble kitchen counters, floors, bathrooms! I love marble, don't let anyone talk you out of it. Okay, so you of course should seal your marble and seal it often, you should also seal your granite and seal it often. You can buy the sealer at any hardware store and it hardly cost a thing, and you can do it as often as you like. I have a homeowner who sprays it on every week. Go for it! Exactly what you said. Marble has been used in lots of places that get tons of abuse (like NYC subway stations!) and it still looks good. I seriously don't get the warnings. We just installed Danby White marble in our kitchen and I couldn't agree with your comments more. We had to sign waivers, and one fellow at the show room wouldn't even sell it to us. I absolutely adore it and don't regret it for a second. As long as you seal it often, marble is plenty durable. All stones have their drawbacks: marble, granite, soapstone are all porous, and quartz is prone to cracking under heat (did you know you can't use your crock pot on it?!?). If marble is for you, I say go for it. Every material harbours some kind of risk, but with proper care you'll be just fine. Seal and polish it, don't put red wine glasses or furniture stain cans directly on it, etc etc. It's basic common sense for any piece that you love. Get what you love! Thats interesting. Never knew quartz was so temp sensitive. Even more of a reason to stay away from it. ps: soapstone isn't very porous at all. its virtually impossible to stain no matter what Ive done to it. Have you considered a different finish to your granite countertops? We saw one with a velvet finish. It's less shiny and I really wish we had paid extra to go with it. Just a thought. Our marble countertops will be honed not polished. I really dont like the look of granite in either finish so it wouldn't make enough of a difference for me. I hear you on the marble front.... I love marble, white Carrara is my favorite. Century old churches have marble floors,thousands of foot steps on them! Restaurants, bakeries etc just don't think twice so why should we. I just put marble in my two master bath suites for my boys, sinks, floors, showers. I prefer honed, the slabs look old from the start...They are beautiful and masculine at the same time! I hope you go with what you love! I have showed the baths on my blog if you want to visit sometime! Have fun can't wait to see your finished room! Have you ever visited the Capitol building in Washington? Marble floors, marble columns, lots and lots of marble. Same with some of the nearby office buildings - lots of marble. It looks great and has such character. Go with marble. I just bought a honed carrara marble slab for my bathroom vanity. I got the same dire warnings and went through the same fruitless effort of looking for something similar that I liked as much. Nothing measures up to the look of marble. I'm with you - I WANT that lived in, lovingly used patina. I told my husband I want it to look like its previous life was as a counter-top in an old Parisian bakery. The only concession I have made is to promise not to color my hair in the bathroom anymore. I say stick to your guns. I am not a fan of marble at all (I think it's beautiful, but it looks cold and funereal to me) but you LOVE it, and it's not like you have a huge amount to deal with and this is not your primary kitchen, so it won't get the same wear and tear. LOL, I probably used the wrong term.... it reminds me of cemeteries, especially in the South, and especially in New Orleans! I do hope you go with your heart. Marble is gorgeous and fits perfectly with your aesthetic. I had a granite guy bid against a quartz guy (neither knowing the other was bidding against a different material) and the quartz guy underbid my granite guy by $2,000 in the end. I never lied - I simply said "my other guy can give me what I want for $____" and we would go from there. It goes to show the overpricing. We got a very stark white quartz and I LOVE it. Good luck. Well done. In our case we can barely get these guys to look up from counting their piles of money to give me a quote no less bid against each other. I always try to negotiate but I'm not getting anywhere. LOVE the marble! My mom has it in her bathroom & it cleans up like a dream. I would love to get it, but hubs won't let spring for the extra cost.  Last time we were at Flemington Granite & Architectural Supply (they're in Somerset or Hunterdon County NJ - can't remember which), but they had some really nice marble remnant pieces (which were on sale too!). Certainly stick to your guns because let's face it how many times are you going to redo the kitchen? We used a granite called White Fantasy that looks pretty close. However, I would strongly suggest seeing the slab before it is cut. Friends of ours used it and it was more grey than white. Are you talking about granite or marble? I know there is a white fantasy marble but I've never heard of white fantasy granite. We have it in our bathroom too and I haven't had any issues (despite never sealing it nor do I take any special care with it during tooth brushing, make up application, etc). Im sure it does etch and stain but it doesn't bother me that much. I work for a granite/marble/quartz fabricator. If you are into the grey and white. There is a granite that looks like Carrara. It is called either Super White, Super White Extra, White Fantasy or White American. Every supplier has a different name. Marble is a little harder to care for, but if thats what you want go for it! Good luck! 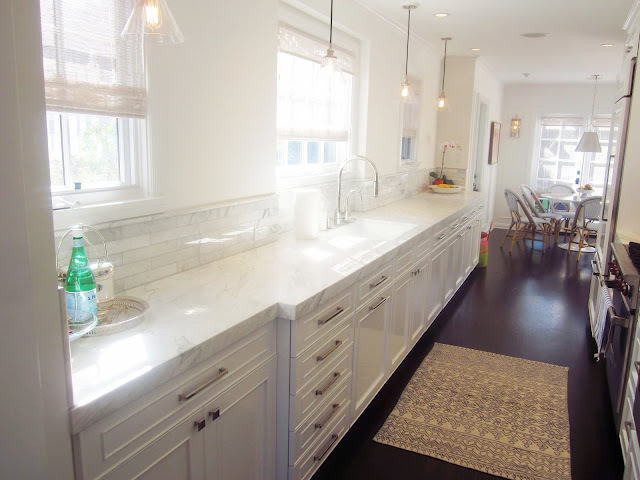 We used Carrara marble for our kitchen countertops and couldn't be happier. If you're looking for sources, try Foro Marble on 3rd St. between 3rd Ave. and Bond St. - they gave us a very reasonable price and were a pleasure to deal with. Thanks! I think I might have to branch out into NYC suppliers since the NJ people aren't that friendly. I adore Aubrey's kitchen! I can totally see the benefits of using Quartz, I'm just not willing to pay double the price for it. We searched and researched for a year and ended up with Viatera and were told that it would last the life of the house without stains, scratches and if nicked it can be repaired. Additionally, it never needs sealing. The price was great and we got it at Home Depot. We love it and it still looks absolutely brand new despite the fact that we are not very careful with it. And it does take heat. We just completed our kitchen renovation just over a year ago before moving into our house. We went with Cambria quartz in Torquay and we love it. I just use a butcher block slab to put crock pot or hot items to protect the quartz. The only draw back for us were the length restrictions (which I can't remember what it was) without having a seam on a long wall or island. Quartz was really the only stone I would have considered as an alternate but its pricing out to be almost double the price of marble. I just can't bring myself to shell out so much for it but its a beautiful choice in its own right. Interesting because our quartz was cheaper than our granite quote, but it might depend on location. I just moved to NYC from NC but have been following you for a while now. I renovate distressed properties and then re-sell them after I have leased them for a few years. One renovation in particular I used Calcutta Gold Marble in a honed finish as the top for a kitchen island. I mixed this material with dark stained oak tops for the rest of the kitchen. Despite what everyone said "YOU'RE GOING TO USE MARBLE IN A RENTAL???!!!" I did what I thought looked best and I rented to some fabulous tenants for 2 years and then put the house on the market. Guess what every single realtor commented on.. You got it.. the beautiful marble- the sale closed in 35 days. One thing that can make the marble more durable is to get it honed vs polished. Honed gives the marble a much more contemporary look and is less prone to showing scratches. Also choose an edge profile such as straight egde or a round edge... Bevels and Bullnoses are more fragile and prone to breakage from guests or in-laws trying to put away platters or other heavy items into lower cabinets. My two cents: Do what you love. I would try Verrazano Tile & Granite. They have a yard in Staten Island. Their prices were substantially cheaper than others and the service was excellent. The man that works in the yard, Timor really knows his stuff. He helped me pick out a slab to match my 2 tone cabinets and it's out of this world. When I redid my kitchen in 2009 I was torn between Soapstone and honed Calcutta Marble. I went with the Calcutta because I have a typical NYC galley kitchen and wanted to keep the look all white and streamlined. It has amazing "curb appeal" - but, at times I wish I didn't have to be so careful with it. I think quartz and quartzite are getting confused. Quartzite is a natural stone that can have softer, more marble-like veining than granite and won't etch or scratch. It does need to be sealed well, as it is somewhat porous. Quartz refers to a manmade product such as Cambria or Silestone. You're getting the "don't use marble in a kitchen" speech so the distributor and fabricator can't be held responsible if your marble etches or stains. I have Venatino honed marble in my kitchen,and it etched within a week, but I love it anyway. Get the marble! I refinished a 1926 bungalow. I went back and forth - had people warn me and tell me I was crazy for wanting marble. I went with it and honed it. Never looked back. Get what your heart desires. I don't understand why people are afraid of marble. Screw em Angus! Do what you want. Marble is by far the prettiest and you deserve the prettiest! i just got marble for my galley kitchen. since my kitchen was so small, i felt like i could afford to try marble (if it only lasted 5-6 years, so what). but i was surprised to find that it was significantly cheaper than any other granite they showed me. so it was cheaper, and i liked it more? no brainer. one place i went told me i would have to sign a waiver and tried to dissuade me, but when i went to the second place, they told me not to be concerned! i'm only about 75 days into my marble experience, but nothing alarming has happened yet. do it. nothing can match the look. Any chance you live around me? Despite everything I've read about marble being about the same price as granite, every place Ive been wants to charge double. So frustrating! I was scrolling back through but didn't see your final decision. Did you decide on the counters? I have a new kitchen with quartzite and love it. It was more costly then granite and but comparable with marble. I got it at StoneTech in Trenton, NJ. I too wanted marble in my kitchen but when I took a close look at a carrara marble countertop in my masterbath which has etching from light wear I knew quartzite was the way to go. I tested the stone before I made the final purchase, lemon, ketchup, beets overnight >> no staining. I’m such a fan of marble in the bathroom and Your views certainly remind me why…love it for a kitchen countertop too!